I'm Ok being a Sooner! I keep hoping I'll get to GA during peach season, but so far it's not worked out. Both my DS and DD live around the Atlanta area. Son took a job and moved, then bought a house that is about 40 miles from UGA. DD switched from Nevada State to UGA and moved in with her brother for several years. She's now engaged and still in GA.
Love the names! I'm not a Sooner fan, so I'm happy I'm going to be a "later"! We will definately not mix up the names this time! I never did post pics of my fabric, so I will when the individual threads are posted. No snow in Wyoming, it has been so dry we sure need some. Fingers crossed that the sky will be clear tomorrow night to see the super,blood, moon eclipse or whatever it is! Great names. Not mix-up-able, for sure! Seems like everywhere that the huge snowstorms were predicted, they didn't happen... or to a much lesser extent. I'm sure no one is upset about that! We got tons of wind and rain... and flooding. It's supposed to come back in and rain mid-week. We're pretty soggy here. In this part of Michigan we've had hardly any snow. Usually about .5 inch in the morning that melts by afternoon. Today we had 2 -3". Fabric is washed, need to get busy cutting. Love the names! This time I might be able to remember which is which! Sounds like the names are winners! really wet and soggy here. Blah. Sorry...but you might be waiting awhile if you try to mail Monday.. Its a federal holiday, no mail, no banks...dang it! I like the new names. Unfortunately I was too late to offer my suggestion of earlybirds and nightowls. Janice, maybe you can consider them for the next boom. It's been snowing here all day and are expected to get 6" to 9" before it's finished. They are predicting a lot of wind and really cold temps with windchill below 0. That's okay because I'm not planning on going anywhere. I joined the wall hanging swap and have been working on that. Unfortunately, my machine kind of seized up on me. I have to try and figure out what is wrong with it. I do have an older machine that I might have to get out and do a little maintenance on it. We'll see what happens. I've got to have a working machine before I get my boom package!!! I don't think there will be any mail on Monday since it is Martin Luther King day. Well, darn! So much for my Monday morning plans! You have to love the unpredictablitiy of the Weather. Here in PA we got mostly rain, not complaining. Snowing now but only predicting about 1 inch in my area, not the 6-8 that was expected. Yay. I have a meeting I need to get to tonight. I'm hoping they will cancel because the wind chill right now is -10 and the temp is going to be 3 tonight. I am ready to mail on Tuesday. Here are some if not all of the fabrics I am sending. Have fun Sooners. Ooh, Klaws...those are great names. Thank you! They'll move to the top of the list for next time. I believe you are right about mail tomorrow. Good prep day though. Get this, Klaws, yesterday my old Kenmore machine began making a never before heard clunking noise. A trip to the repair guy is now a necessity for it too. Oh, dear! I've got a cheapie little portable but I wouldn't want to make all my blocks on it. Well, I'll deal with the problem sometime next week. So, Boomers, I'm running behind with my emails and dedicated posts. I got sidetracked yesterday by things that "had" to be done. Nothing serious, just non-ignorable events. Anyway, I'm back at it and am proofreading everything, eliminating any all-caps words from my posts that somehow keep sneaking in when I'm not thinking clearly, double-checking dates, etc. I know there will be something I forget or mix up so as always, bear with me. Be looking for dedicated posts within the hour and your emails shortly after that. Please be sure to read the email in it's entirety and then hit "reply". Doing so confirms you've gotten it as well as your acceptance of the rules. Thanks so much! Your new group threads are up. Please move on over to those threads and start posting there. Any recent pictures in this thread, I'll add to the gallery shortly. Thank you! 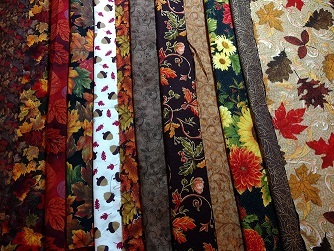 I love your fall fabrics, those are beautiful.